It is getting towards the end of the school holiday and many parents have now started preparing their kids ready for another year of school. But did you know with children, the bones in their feet don’t fuse together until puberty, and they can undergo rapid development during their school age. They can often experience pain in their feet, ankles, shins or even in their knees. These are often overlooked by many parents as normal “growing pain”, however, they can have a serious effect on your children’s feet and their adult life if left attended. It is still recommended to have your child assess by a podiatrist at least once a year even if they do not have any trouble with their feet and legs to ensure healthy development and maintaining their foot health. If your child is actively involved in sports, then it is even more important to have their feet checked regularly by a podiatrist as they undergo more stress and impact to their growing feet. Call us now on 3800 9491 to book an appointment for your child to have them assessed by one of our experienced podiatrists. 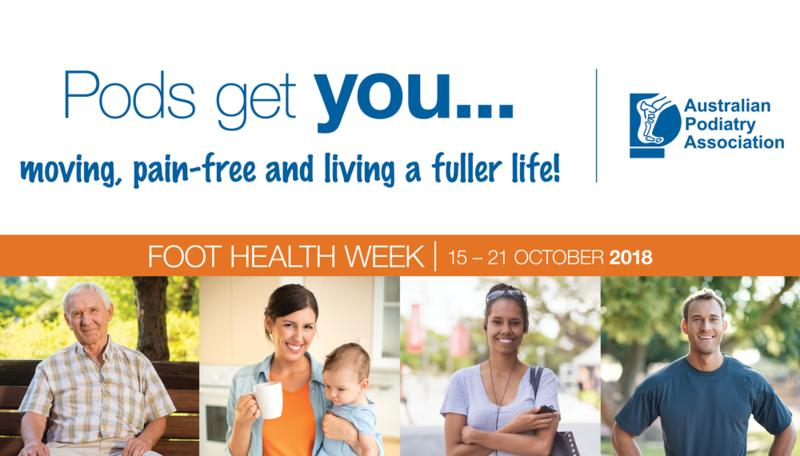 Did you know that this week is the annual 2018 Foot Health Week? 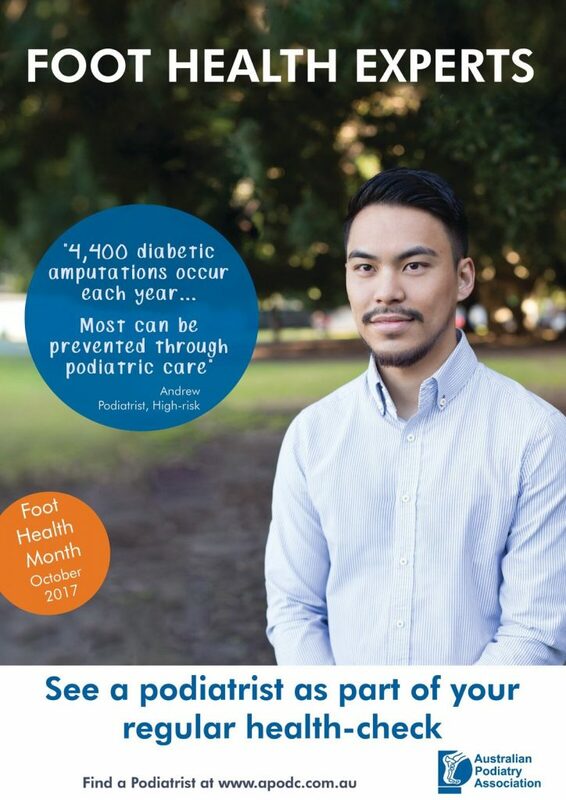 Australian Podiatry Association runs Foot Health Week, an annual campaign to promote foot health and encourage better health outcomes for all Australians. To get you started, what is podiatry and what does podiatrist do? Podiatrists are foot health experts who are university-trained to prevent, diagnose, treat and rehabilitate medical and surgical conditions of the feet and lower limbs. The conditions podiatrists treat include those resulting from bone and joint disorders such as arthritis and soft-tissue and muscular pathologies, as well as neurological and circulatory disease. Podiatrists are also able to diagnose and treat any complications of the above which affect the lower limb, including skin and nail disorders, corns, calluses and ingrown toenails. Foot injuries and infections gained through sport or other activities are also diagnosed and treated by podiatrists. A range of skills are employed by podiatrists. Direct consultations include a clinical history composition, physical examination, diagnosis, preparation of a treatment plan and provision of a range of therapies. Clinical assessment techniques aim to secure a diagnosis and prognosis and take into account clinical, medical and surgical history, footwear, occupational and lifestyle factors, and may incorporate the use of diagnostic equipment such as vascularscopes or radiology. Gait analysis will often be undertaken through visual or computerised means and might include range of motion studies, postural alignment evaluation or dynamic force and pressure studies. Clinical services require skilled use of sterilised instruments and appropriate infection control procedures, along with appropriate application of pharmacological agents, specialist wound dressings and a variety of physical therapies. Prescription foot orthoses (in-shoe devices) offer permanent solutions in the treatment and prevention of corns, calluses and necrotic ulceration in their capacity to provide pressure redistribution. As a technique for providing consistent weightbearing realignment they are utilised in the treatment of acute and chronic foot conditions such as heel pain, tendonitis, recurrent ankle sprain, chronic knee pain and stress fractures, to supplement and enhance clinical care. Why do people see podiatrists? Your feet house a quarter of the bones in our entire bodies – in addition to various muscles, ligaments and joints. This makes them extremely vulnerable to injury and diseases that can affect the entire body. Podiatrists fully understand the structure and movement of the foot and lower limbs. They are able to diagnose foot conditions, identify systemic overall health conditions that present with foot or lower limb symptoms – and recommend appropriate treatment plans. You may be experiencing pain in your feet, ingrown or discoloured skin/nails, corns, skin rashes, foot odour, foot injuries, broader health problems such as diabetes or arthritis, recurrent tripping or falling, problems fitting comfortably in your regular shoes; or if you notice swelling, lumps, or redness on your feet or legs. It is a common misconception that painful feet are a normal side effect from everyday activities. Yet research shows that only a fraction of individuals suffering from sore feet seek out professional advice. Just as you would visit your dentist for a toothache, you should visit a podiatrist if you suffer from painful or tired feet and/or lower limbs. Do you think you may need to see a podiatrist? Here is a easy checklist for you. Need advice on correct footwear? Ticked one or more boxes? Then you need to see a podiatrist. Feeling that chill in the morning and having trouble getting out the bed? Digging out all your lovely enclosed shoes and boots? Yes, we are officially in the cold winter now. 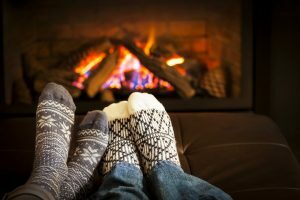 It is easy to neglect our feet during the winter months. We often hide our feet into a warm pair of shoes and as the old saying goes ‘out of sight, out of mind’. This time of year presents unique challenges for our feet. Looking after them now will ensure they are in tip top condition by the time spring rolls around. We will be discussing one of the most important topic which is “Shoes”. Who’s secretly happy to hide their feet again as boot-season is upon us? Well, you’re not alone. In winter time, our feet are mostly covered in enclosed shoes to keep the feet nice and warm. That’s why it is very important that you are wearing the right shoes with the right fitting. An ill fitting shoe can create problem such as painful corn and callus, ingrown toenail, thickened or bruised toenail. It can also cause bony deformity such as claw toes or bunion. Leather is preferred for shoe uppers. Synthetic or rubber soles are best for the sole as they tend to be more durable, shock absorption and provide better grip than leather. Shoes should be secured on the feet with laces, straps or buckles. If your feet have to work to hold your shoes in place, your foot muscles may be strained. Pointed shoes can cramp your toes together. Clenched toes can cause rubbing, leading to corns and calluses. Broad- toed shoes prevent the feet from cramping but must be secure so the foot doesn’t slip or slid which can also create rubbing to the feet. The best time to buy shoes is in the afternoon as the foot will generally swelled up throughout the day. 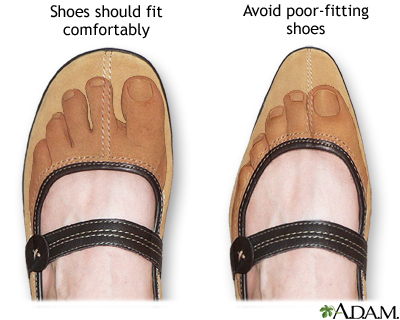 Fitting shoes, while the foot is at its largest, will ensure the shoes fit during a full day. Socks and orthoses can influent the sizing of the shoes as they can take up spaces inside the shoes. Therefore, it is best to wear the socks or the orthotics that you normally wear. Decide if you will get shoes with laces or velcro. If you have trouble reaching your feet then velcro or slip on shoes can make your life lot easier. It is very important to have both feet measured and shoes fitted as often the size of the feet are different. When fitting, pull the insole out from the shoes, have your foot on it, and make sure there is one thumb width from the longest toe and the foot is not hanging off on the sides. Always walk around the shop and trial the shoes before buying to ensure they are comfortable to wear. See a Podiatrist for Footwear Advice. A podiatrist can provide you with footwear education and advice based on your legs, feet, and how you walk. The heel of your shoe is less than 2.5 cm. High heels increase pressure onto the ball of your foot and adding stress onto the lower back. Your shoes have a well padding sole. A cushioned sole absorbs shock and reduces pressure to the feet. Your shoes are made from a material that breathes. Fungal infections such as tinea love a warm moist environment. Your shoes protect you from injury. Your feet must be protected from your immediate environment. People with diabetes, peripheral nephropathy, and circulatory problems need to be especially careful that they do not injure their feet. Alternating footwear each day during winter will allow shoes ample time to ‘air out’ between wears. The added warmth from closed shoes and warm socks may cause your feet to sweat, increasing the risk of infections such as tinea and fungal nail. Absorptive socks can help with drawing moisture away. As you may wear thicker socks in winter, ensure shoes and boots fit comfortably and are not too tight. We hope the above tips can help you get the right shoes for this winter. If you do have any trouble finding the right winter shoes, our Podiatrists can get you the right shoes for your feet. At our Browns Plains clinic we also stock a wide range of high quality comfortable winter shoes that are recommended by Podiatrists. 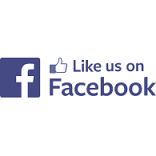 You can Click Here to check the brands that we currently stock or come in and pay us a visit! What do I mean by moment? That is when you should be calling a Podiatrist. If you leave it a week, or worse a month when that slight occasional ache is now causing you to limp even at work, it is going to take a lot longer to get you back running to your best ability. We have all been told the standard RICE – rest, ice, compression, elevation. Unfortunately, when injuries are left to the point of you limping or struggling to walk, there is little else that can be done in the short term to settle down the injury. BUT if you come in as soon as you feel discomfort, often a Podiatrist can prevent any injury from worsening and get you back to your best in days, rather than weeks and months. Foot pain is not normal. Not at any age. 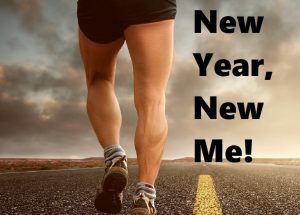 Not if you run a 5km Parkrun per week or 100km a week! There is always a cause and where there is a cause, there is a solution. The foot has 26 bones, 33 joints and over 100 ligaments, muscles and tendons. This makes it a complex puzzle to solve when we are looking at foot pain and that’s where a Podiatrist can help. Most runners are familiar with the common causes of pain – plantar fasciitis, achilles tendon injuries, shin splints etc. But there are actually hundreds (probably more like thousands) of different foot injuries. At Brisbane Foot Clinic, our Podiatrists collectively have nearly 30 years of experience under their belt. If they haven’t heard of a condition – well we’d be surprised! So remember, if you have the slightest niggle, get advice early. There is nothing more demoralising than having to pull out of an event you have been training for due to injury. We want to help you achieve your goals because there is nothing better than the flood of endorphins when you get your medal at the end of a great run! Pain in any part of the body is debilitating and can stop us from doing the things we want. Podiatrists treat a lot of different types of pain to get you moving again. Older people often can’t reach their feet and therefore can’t care for them as they should. Podiatrists provide care for those who can’t care for themselves. One of the most important things in aged care is preventing major problems occurring and prolonging healthy living. There are over 4,400 diabetes-related amputations in Australia every year and most are preventable with the correct treatment plan. As part of your healthcare plan it’s important to visit a podiatrist to prevent serious health issues and maintain healthy feet. Regular visit with a podiatrist about your diabetes can often help avoid unnecessary surgery.